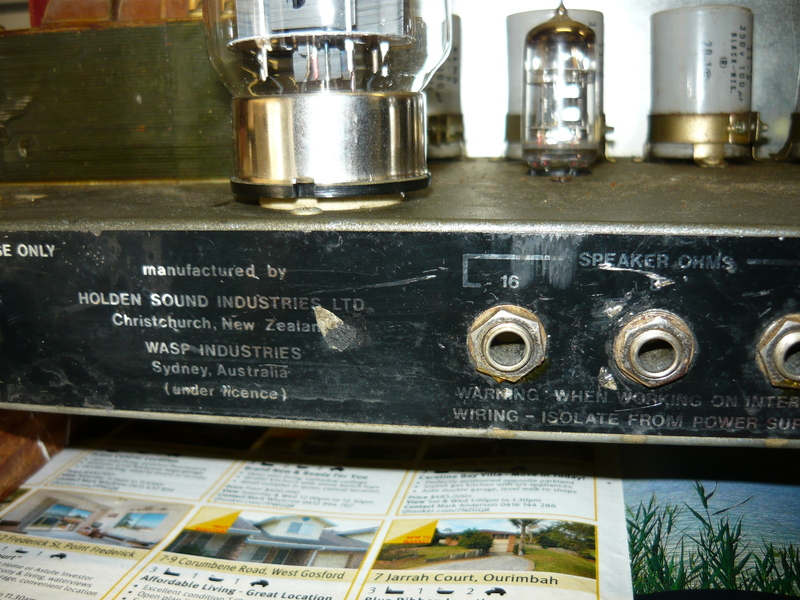 HI everyone – this week it is appropriate to mention the WASP amp, made in Sydney under licence from Holden Sound Industries in Christchurch, N.Z. We have been servicing the Wasp amp since the 80’s, and the occasional Holden amp that came across from N.Z., although we see them only occasionally lately (a couple of units per year ??). 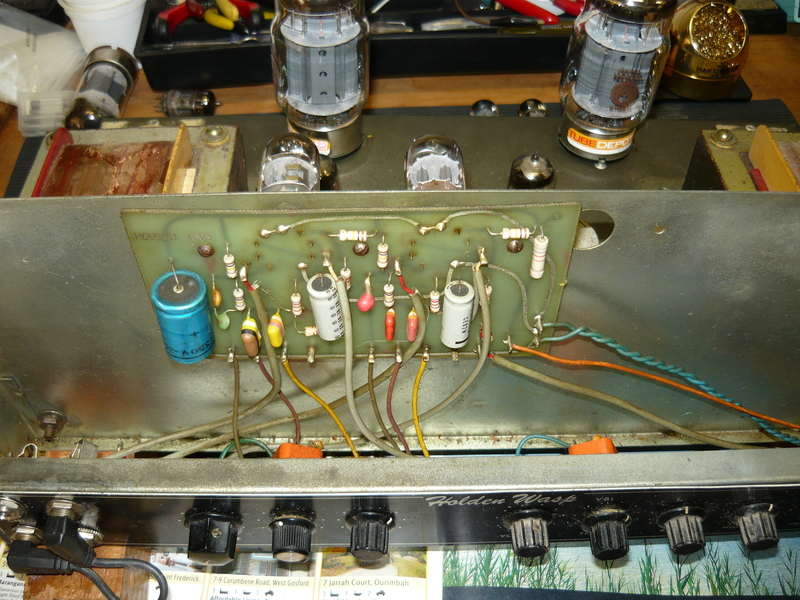 We still have all our schematics and service notes from back in the day, so if you are the proud owner of a Wasp and therefore Aust/NZ rock’n’roll history, we are the service workshop well qualified to restore your amp to full working order. 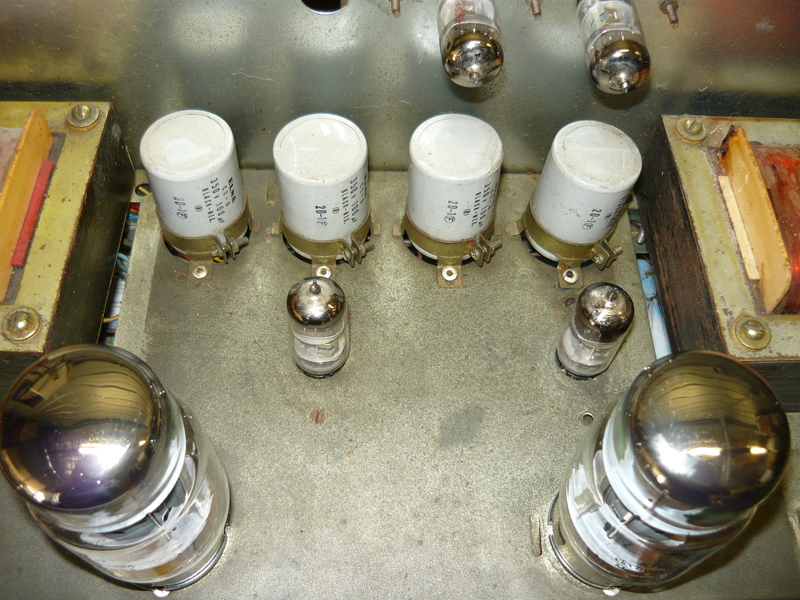 Ian Johnstone has stated on a forum that Wasp in Australia was started in 1967, and that they manufactured amps employing KT88, 6550 and EL34 power output valves. I can remember from years back some references to people visiting the Wasp operation in Sydney’s inner-west, perhaps it was Leichhardt, perhaps it was Marrickville ? They stated seeing speaker cabs being assembled there. All the Wasp amps that I have ever seen were most likely manufactured during the 1970’s golden-era of rock, and were originally loaded with and biased for the great KT88 English-manufactured valves. This even applies to an obscure made-in-NZ Holden 75 watt amp with an excellent valve-driven tremolo (ie output valve bias modulation). Of course, by the end of the 70’s the KT88 valve was becoming difficult to find and prohibitively expensive, so people starting substituting 6550 valves, which is OK with appropriate changes to the bias supply, and EL34/6CA7 valves, which is really living on the edge, and in fact asking for a lot of trouble. Not everyone who serviced these amps from the 80’s onwards really knew what they were doing, and the Wasp amp became a liability in terms of on-the-road reliability, through no fault of its own. This design uses very high internal DC voltages, over 600V in fact on the KT88 anodes, and over 300V on the screen grids. This is how 100 watts output is achieved from a single pair of output valves, and 200 watts from a quad. So setting the bias at optimum for each change of valves is obviously important, and also the original value of screen grid resistors of 270 ohms is inadequate for modern valves, this should be increased to 1K (in my opinion). The Welwyn 7W W22 series ceramic body resistor is perfect for this application in such harsh conditions as exist in a high-power valve (tube) amp. Ideally the screen grid supply should be regulated, and clamped at 300V maximum. With higher value screen grid resistors this would improve output valve longevity quite considerably. In recent times valve (tube) factories in Russia, Slovak Republic and China have been producing a KT88, so we now have more choices than ever before. Recommended brands include JJ, Sovtek/Electro-Harmonix, and Winged-C (formerly Svetlana). You can see in the photos an example 200 watt Wasp amp where I have installed a matched pair of KT88-EH with good results. 200 watts is way too much power, unless you’re the bass player, so the age-old trick is to install only a single pair of KT88 (6550) and then adjust the impedance the output valves are working into upwards by plugging your 8 ohm cab into the 4 ohm jack on the rear panel. This works a treat and delivers exactly 100 watts ! Still pretty damn loud, actually. Unfortunately, the Holden/Wasp people saw fit to only provide a non-adjustable fixed-bias supply set to some arbitrary theoretical ideal value. Not a great idea ! Even in the golden age of valves (tubes), the parameters from valve to valve could vary quite significantly, so only a proportion of amps leaving the factory would have been correctly biased. HUH ?? In order to raise or lower the bias volts, we have to resort to this technique: add an appropriate value resistor across the series bias supply dropping resistor (470R) to increase the bias volts (decrease KT88 current draw), or add an appropriate value resistor across the 8.2K resistor that goes from the bias supply to ground, to lower the bias volts (increase KT88 current draw). The other alternative is to install a pot somewhere convenient on the chassis. Any amp this old will need a lot of work in addition to new output valves, with particular attention paid to electrical safety issues. The 240V 3-pin plug will be pretty trashed and should definitely be replaced. 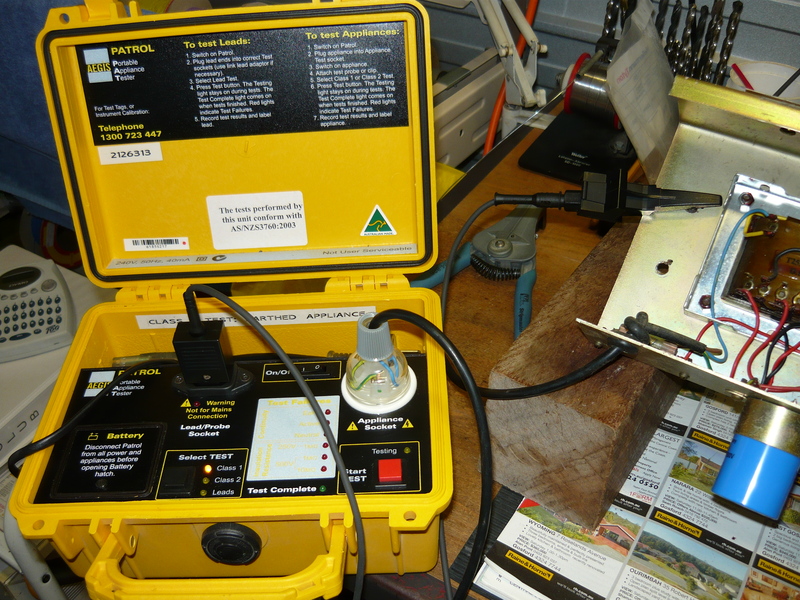 The earth must be tested according to Australian Standards as specified by Workcover NSW, typically using a PAT (portable appliance tester). From the earth pin on the 3-pin plug to any exposed metalwork on the amplifier should read less than 2 ohms, otherwise we are not complying with the standard. Most of the electrolytic capacitors will be at the end of their working life and will need replacement/upgrade. This particularly includes the 4 x 100uF/350V can mounting capacitors you can see in the photos. 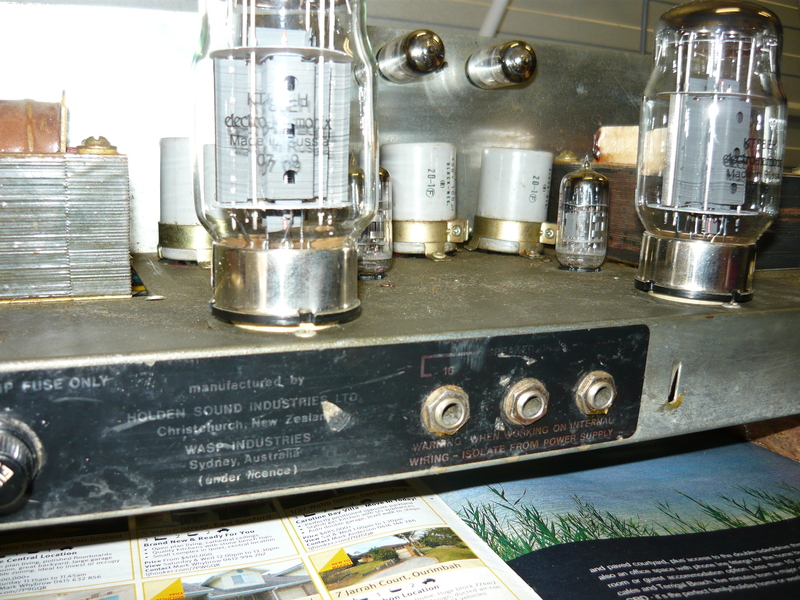 The condition of the pots and jacks, including the wiring, in the preamp section at the front is always very poor. Asian sourced jacks were used, rather than Switchcraft. I definitely recommend replacement with Switchcraft jacks for improved connectivity. The toggle switches have often been replaced with cheapo units, and one of the neon indicators is usually smashed – this is a bit of a problem finding a suitable replacement that is an exact fit. At the very least, the jacks need to be cleaned with DeOxit, and the pots given a blast with FaderLube, which both cleans & lubricates. All the Wasp amps that I can remember seeing had two discrete preamps, a British voiced channel and a California voiced channel, with a 12AX7 valve (tube) each. There is an active prescence control in the power amp circuit as well. The preamps are in-phase so they can be patched together for a bigger sound. All circuitry is on p.c.b.’s. The preamp board is mounted vertically on a shield between the preamp and the transformers. Not a bad idea except that the shield is not very rigid. The valves are nearly always microphonic and well past their prime. The 9-pin sockets will benefit from a clean as well. The phase-inverter and driver stage valves are on p.c.b. mounted sockets as well, but closer to the output valves. A quartet of KT88’s benefits from being driven from a lower impedance. 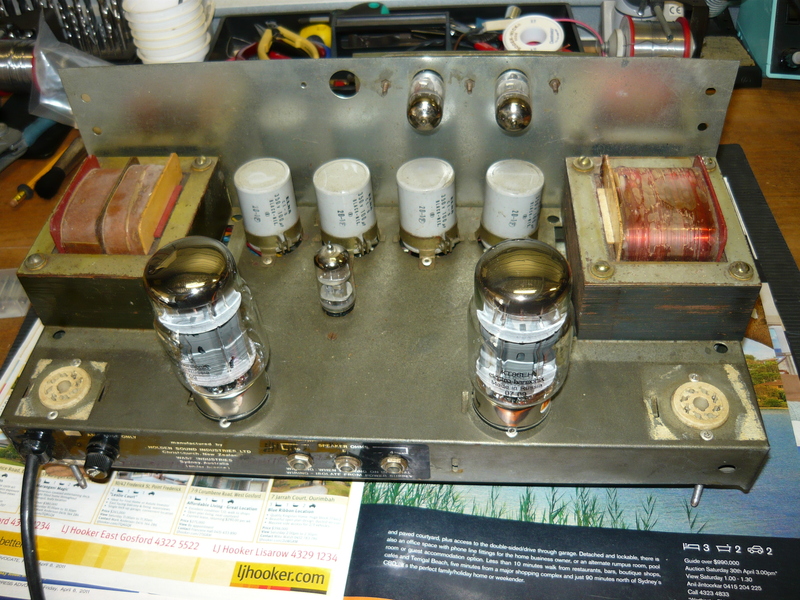 The Wasp amp used two valves to implement the phase-inverter and cathode-follower driver stages. Some amps used a pair of 12AX7 valves for this, and the later amps used a 12AT7/ECC81 phase-inverter, followed by a 12AU7/ECC82 cathode-follower. This is good engineering practice – 12AT7’s and 12AU7’s in particular are superior to the 12AX7 as a driver. Unfortunately, the chassis is NOT labelled to indicate which valve goes where, and just about every single amp I have ever seen has these valve positions accidentally reversed ! You can see what I mean about taking your amp to a tech who has the knowledge and experience to deal with the idiosyncrasies of your particular model. This particularly applies to VOX AC30’s/AC50’s down through the years, and all the vintage Aust/NZ valve amps. The owner of the amp you see in the photos was on a rather tight budget, so we just took care of the most important things, and left capacitors/jacks/pots for another time. The work carried out included clean chassis and valve sockets, new 240V 3-pin plug, electrical safety testing, 1 very microphonic 12AX7 valve, replace pair of screen grid resistors with 1K w.w. ceramic, install matched pair KT88 valves & rebias amp, power output test 100W, burn-in test, final play test OK. Thanks to Jacob for providing us with today’s blog. Apparently Jacob inherited this amp from his dad, who must have been using it back in the roaring 70’s ! This entry was posted on December 17, 2011 at 8:16 am and is filed under Amp Repair. You can follow any responses to this entry through the RSS 2.0 feed. You can leave a response, or trackback from your own site. Thanks for the comment, Ian, this explains why I have never seen a Wasp amp with EL34’s, ie always KT88’s or 6550’s, which makes sense – IR. Hopefully, we will get more of these amps coming in to the workshop, so we can restore them to their former glory !! Hi, I used to service these in the early ’80s and I am doing it again now here in Auckland. A common mod that muppets perform is to re configure the PI/ driver to use only one valve. I have put a few right. thanks, Alan, keep up the good work ! IR. Hi Ivan. do you service holden amps? i have one that needs service my dad left it for me. do you have contact details? Got a 100W Holden Bass Head in NZ, running on 4 EL34s! Have run it for years without any issues. Sounds beautiful. Got two ECC81s in the front. No idea when it was made. 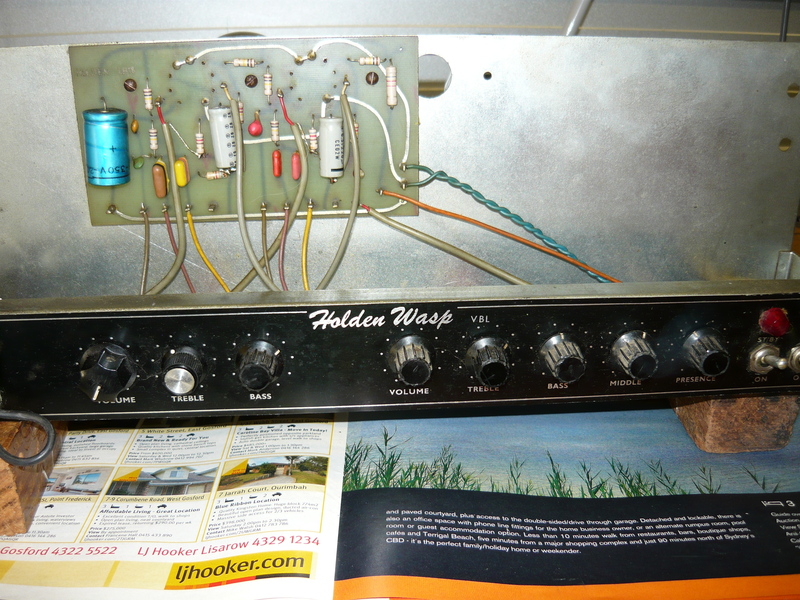 Hey , I have recently had the pleasure of acquiring a Holden VBL 100 amp and are in the process of restoring it , but unfortunately it has had both the power and standby switches removed and for the life of me I can’t find a schematic online to help me install two new switches and indicator lights . I could possible try and work it out for myself but if you had a detailed drawing on how this should be done or can send me photos of one already done in detail it would be greatly appreciated . Hi all, I have a very gud condition Wasp VBL…. Just a beautiful bass sound. 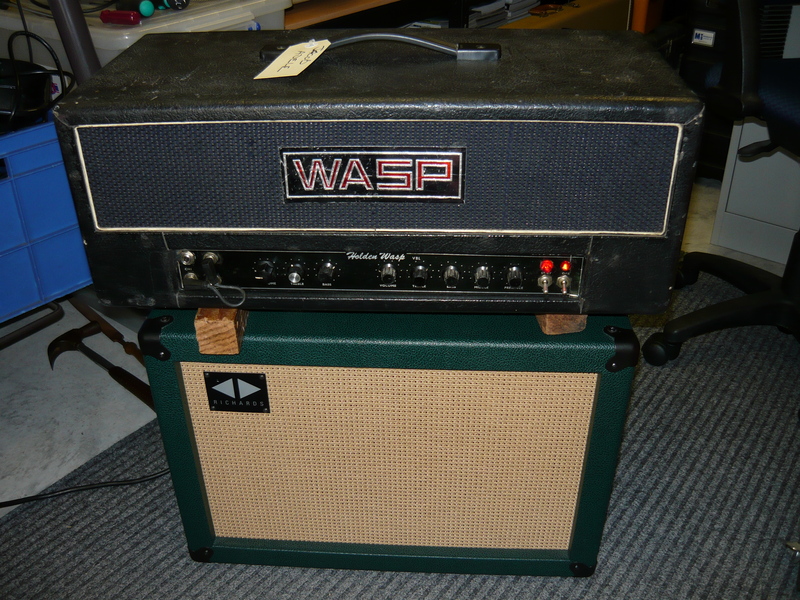 My 2nd Wasp amp and ide never sell it!